By now most people know that sapphires come in lots of other colors besides blue but did you know that garnets come is a vast variety of colors as well? Garnet is actually the name for a group of minerals with common crystal structure and similar chemical composition. The garnet family may be broken down into these main groups - almandine, andradite, grossularite, pyrope, rhodolite and spessartite. With in some of these groups, the color of the stone may be better identified by country of origin. This is true of the pyrope garnet referred to as cape rubies or Mozambique garnets. These garnets are the color one would traditionally think of when you think of a garnet - glowing deep red with hints of orange or brown. Almandine garnet is red in color with a hint of Violet. 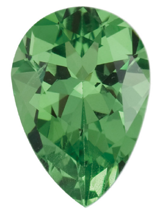 Andradite, also called Demantoid are green in color that closely matches that of emeralds. Rhodolite garnet has vibrant pink undertones of rose and plum - resulting in pinkish to purplish stones. The shade of pink, touched with crimson is often referred to as raspberry. Spessartite garnet is a rich spice hued orange with hints of red or brown undertones in color. The spessartite garnet that are a bright clean orange (like orange soda pop) are called Mandarin garnet. In the grossularite form of garnet, Tsavorite was discovered near the Tsavo National Park in the Northwestern part of Tanzania. This garnet ranges in color from light green to medium dark kelly green - bright and clean, as crisp as lime jello. Cut stones over two carats are rare. Other grossularite garnets can be yellow in varying hues and intensity of color to coppery brown. Garnets receive a 7 to 7.5 on the Mohs hardness scale and are rated good for every day wear. To clean, you can wash in warm soapy water which is always safe and it is usually safe in an ultrasonic. 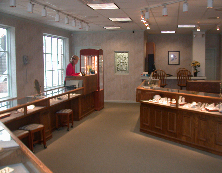 We can clean them for you, our pleasure, and there is never a charge to clean and check your jewelry at Laneys. Never steam garnets as they dont like the heat change. Garnets powers are believed to include healing, strength, and protection. It is believed that the wearer was protected from injuries in battle. It is also believed to regulate the heart and blood flow and aid in curing depression. Garnets are considered the gem of faith and truth. Officially garnet is the birthstone for those born in the month of January and known as the appropriate wedding gift for second and sixth wedding anniversaries. While in some of the more special rarer colors prices climb, garnets in general are an affordable gemstone adding to its allure and making this gem readily available to self purchasers and smaller gift giving occasions. At Laneys, we have a variety of beautiful garnet jewelry just waiting for you. We have garnets in varieties of colors and set in white and yellow gold and with and without diamond for range in appeal and price. We also can custom make something especially for you in any color you choose. 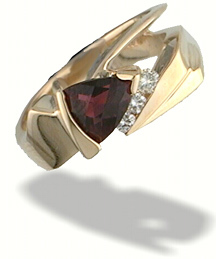 Garnets also an excellent choice for mens rings due to the stones relatively sturdy nature. Visit Laneys and let us share our knowledge of these beautiful gems! You may find a new friend you just cant resist! You can view additional examples of Laney's jewelry at this site as well!